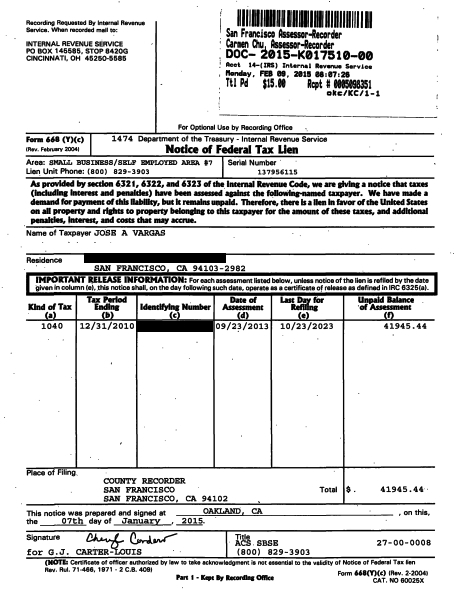 According to court documents obtained by Red Alert Politics, journalist Jose Antonio Vargas was hit with a $41,945.44 tax lien earlier this year for failing to pay taxes in 2010. In a statement, Vargas said that he was hit with the back taxes after he came out and stopped using forged documents. “After outing myself in that article, I stopped using the doctored card my grandfather gave me–including filing my taxes with it,” he said. Vargas frequently appears on CNN and other networks, adding to the list of cable news personalities like Melissa Harris-Perry, Touré Neblett, Joy Reid, and Al Sharpton who were all revealed to owe back taxes earlier this year.